When made with high-quality ingredients, soups are a great idea for anyone working on their health and fitness goals. 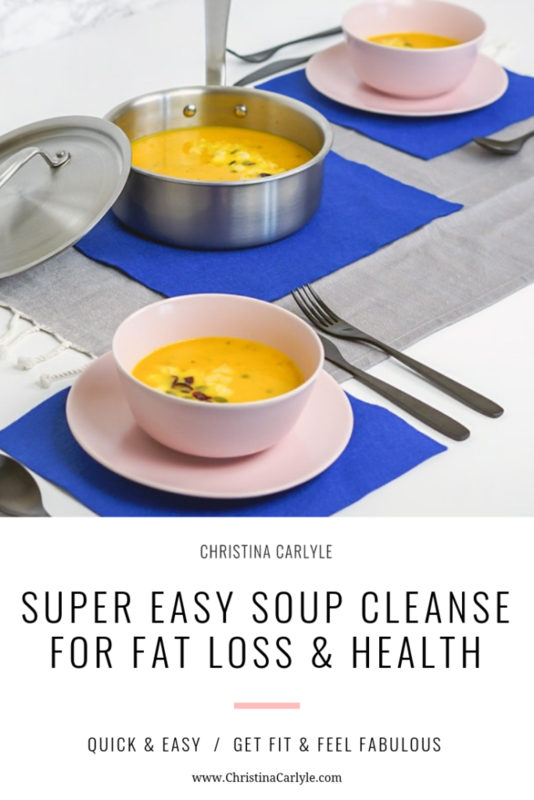 See me explain why soups are so great for you and how to do this soup cleanse to get fit and healthy faster. 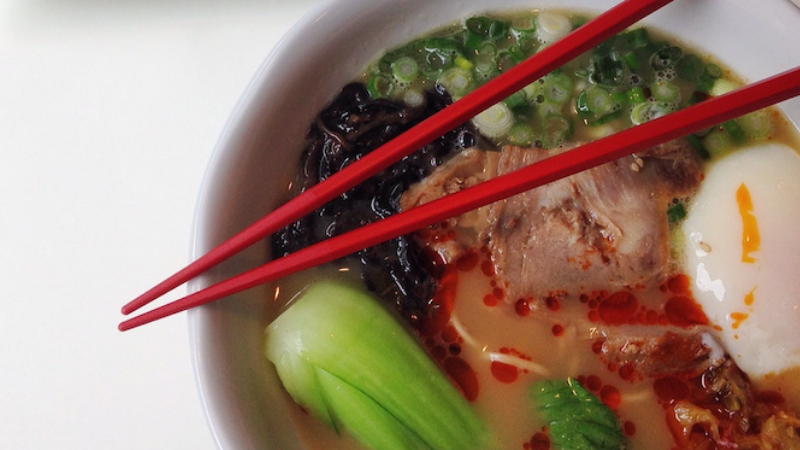 Here are 4 great reasons why I recommend having soup a minimum of a few times a week. Did you know the average adult only eats the same 10 ingredients over and over again? Did you know your body needs dozens of different foods daily to support dozens of different strains of bacteria in your gut microbiome? Soups use a variety of different ingredients. 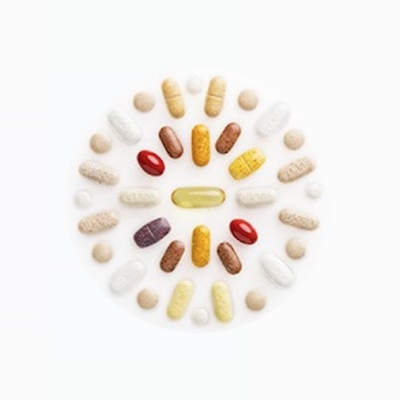 The gut microbiome benefits from getting a wide variety of foods on a regular basis. Soups are an easy way to get different types of fresh veggies, herbs, and spices into your diet on a regular basis, that will encourage diversity in your gut microbiome so you can stay healthy and feel great. Soups have a liquid base, making them easy-to-digest. They’ll fill you up without adding much waste weight or strain on your digestive tract. Because they’re easy to digest, they absorb into the body quickly, so it’s important to consume soups made with only high-quality, organic ingredients. You want to absorb the nutrients, not toxic chemicals. TIP: Using a gut-healing collagen-rich bone broth, as your soup’s base, helps heal and seal your digestive tract, too. Soups, like smoothies, make easy-to-make meal replacements, that pack a huge nutritional punch, for minimal calories, but less sugar. When made with nutrient-dense ingredients and a clean base, soups can help you feel fuller longer, without spiking your insulin levels. The more spices, herbs, texture and flavor you add to your soup can trick your body into feeling fuller, too. Using a lot of ingredients helps add more interest for you and allows you to get fuller faster on healthy superfoods. Plus, herbs and spices also have their own fitness and health benefits. For example, black pepper contains a substance called piperine, which not only gives it its pungent flavor, but also blocks the formation of new fat cells. Cinnamon adds zest to more than just food. The spice contains substances that, in test tube studies, wake up body cells to the hormone insulin which can help regulate hormones. NOTE: The good, better, best is ranking the fitness and wellness results you should expect to experience. GOOD – Soup as a side dish or meal replacement a few times a week. Have soup as a meal or along with a meal. No time limit. 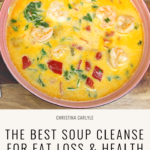 BETTER – Soup as a meal replacement 1 time a day for 3 to 7 days. Have a solid breakfast, snack, and lunch, then soup for dinner. 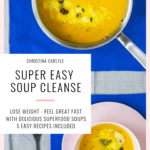 BEST – Soup as 2 meal replacements for 3 to 7 days. Have a solid breakfast and a snack, then soup for lunch and dinner. BONUS POINTS – If you have smoothies for breakfasts and snacks. You can start this now then do 2 meal replacements daily, when you’re ready. Step 2 – Start having organic soup! You can have a soup made with one veggie, multiple veggies, or veggies + protein (animal or plant.) The more ingredients you use the better! You can buy organic soups or make your own. 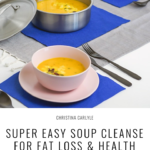 I share tips to make your own soup and recipes below. BONUS POINTS – If your store-bought soup is in BPA-free packaging. Avoid as many chemicals as possible. Choosing organic options allows you to do that. Avoid soups made with the following ingredients. Avoid all grains and commonly processed (GMO) high-starch ‘fillers’ as they are inflammatory and affect the body like sugar. Things to avoid here include, barley, corn, noodles, potatoes, soy, wheat, yeast. Avoid any soups with dairy, including cheese, milk, cream, and butter. 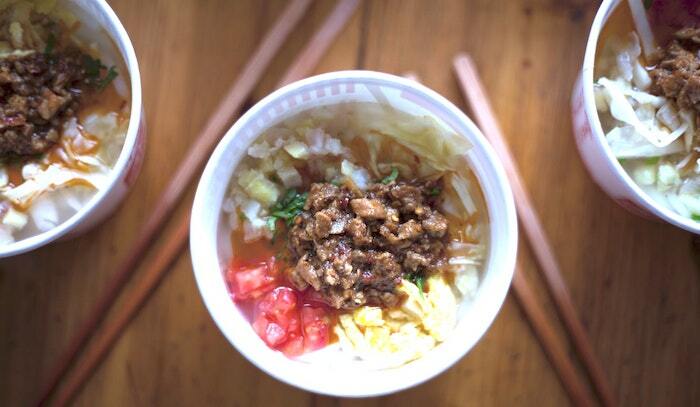 Avoid any rice or rice noodles, too. 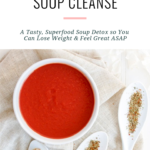 As many chemicals as possible… Because soup is so easy to digest, organic is best during a soup cleanse. 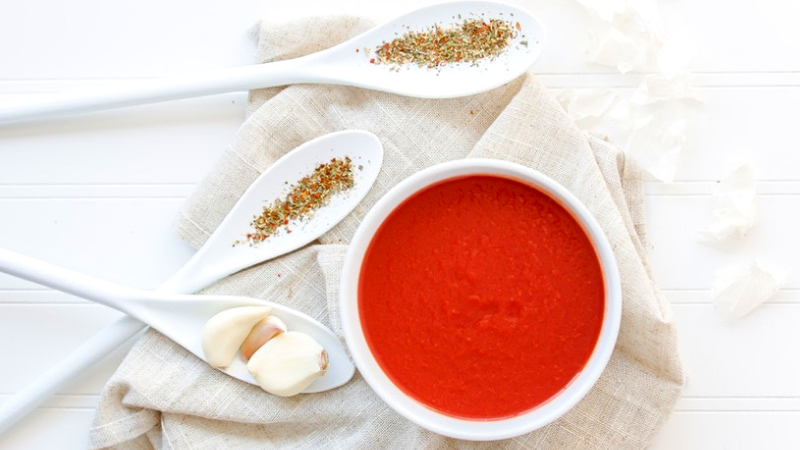 Use these simple steps to create meal replacement soups with cleanse-friendly ingredients. You’ll need a broth base, flavors, protein, and vegetables to make detox soup. Organic ingredients are recommended. This is a cleanse so it’s best to avoid as many chemicals as possible. 1) First, start with a plant-based or clean (animal) fat. You’ll need 2 tbsp. of a plant-based fat for every 1.5 cup. You can use cold-pressed olive oil, flaxseed oil, coconut oil, or ghee. 2) Next, add herbs and spices for flavor and other health benefits. Delicious detox-friendly herbs and spices that add flavor include: quality (Celtic or Himalayan) salt, freshly ground black pepper, minced garlic, green onion, turmeric, curry, shallot, basil, cilantro, oregano, parsley, jalapeños , etc. The more the merrier. The fresher the better. Bonus Points if you use organic spices. (lots of hidden chemicals linger in herbs and spices. TIP: Try a Mirepoix A Mirepoix is a combination of aromatic vegetables cooked first in fat to give a broth/braise more flavor. A Mirepoix of onion, celery, and carrot adds subtle, savory flavor to soups, stews, roasts and sauces. To make your mirepoix, you’ll need of 2 parts onion to one part each of both celery and carrot. Wash, trim, and dice all of the veggies in same sized pieces. Slow simmer the veggies in fat until soft, about 10-15 minutes. After this step you’d add broth, spices and the remaining ingredients. 3) Next, add a liquid plant-based stock or bone broth. 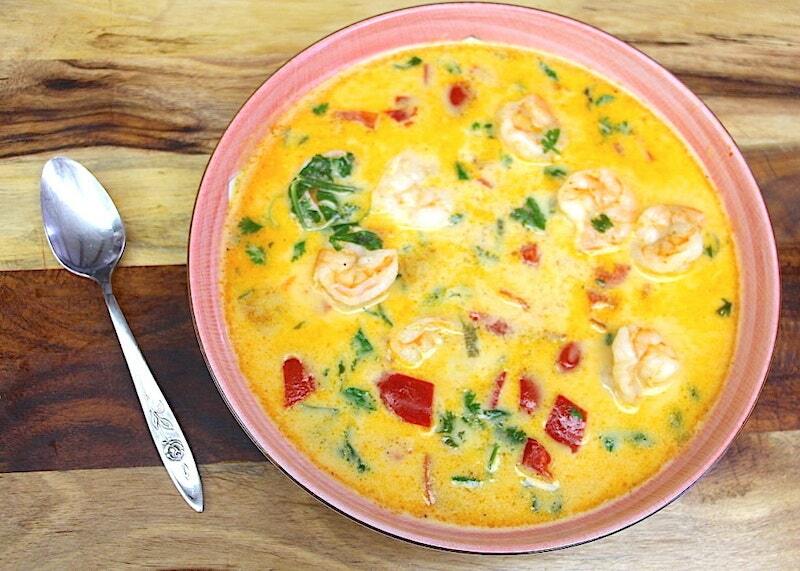 You can use vegetable, chicken, or beef stock, coconut milk, nut milk, or filtered water with herbs and spices. A serving size of the soup you’ll make is approx. 1.5 cups. 4) Next add, 3 oz. of an Organic clean lean or plant-based protein. Ideas include, organic chicken, turkey, egg, beef, meatballs, beans, lentils, mushrooms, tofu, edamame, etc. Meat takes longer to cook than veggies, so add these before veggies. FYI, 3 oz. is about the same size as the palm of your hand. 3 oz. should be added to every 1.5 cups of broth. So if you use 3 cups of broth, you’d add 6 oz. total of protein and get 2 servings of soup. 3/4 – 1 cup total of veggies per 1.5 cups of broth is a good ratio to use. Adjust to suit your tastes. You can do 1 main vegetable like butternut squash or tomato soup or a vegetable soup with multiple vegetables, too. Broccoli, snow peas, mushrooms, carrot, celery, onion, spinach, green peas, are great for soups. Different meats and veggies cook at different speeds FYI. The more stalky or tough something is the longer it’ll take to get soft. Cook dense, stalky veggies and thick proteins first over higher heat. Then reduce heat and add veggies. After a 15-20 minute head start, add in veggies accordingly. So if you’re using spinach and broccoli – add the spinach in towards the very end. Use the ‘use-what-you’ve-got’ mentality and layer in healthy ingredients, you have on hand and need to use up. Remember, your gut likes diversity so have fun experimenting with different ingredients, flavors, and textures. Don’t forget, you can have a soup that’s made with one veggie (like butternut squash), mixed veggies, and a mix of protein (animal or plant) and veggies. The goal is to cook your soup over low heat for a longer period of time. The longer a soup slow cooks the more flavor will develop. 60-ish minutes over low heat is a good place to start. Once everything is combined, slow cook your soup until the meat isn’t raw and veggies are tender but not mushy. You can serve your soup as is or blend after it’s done. You can buy organic soups at your grocery store, that use these proportions and don’t have anything from the avoid list. Yes, they have to be organic if you’re asking. Bonus Points if they have a BPA-free packaging. 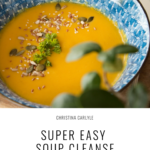 Here are some addictive Soup recipes, I made using the Superfood Soup-Making Method. I really think you’re going to love them. HINT: Soups make for easy ‘meal prep,’ too. 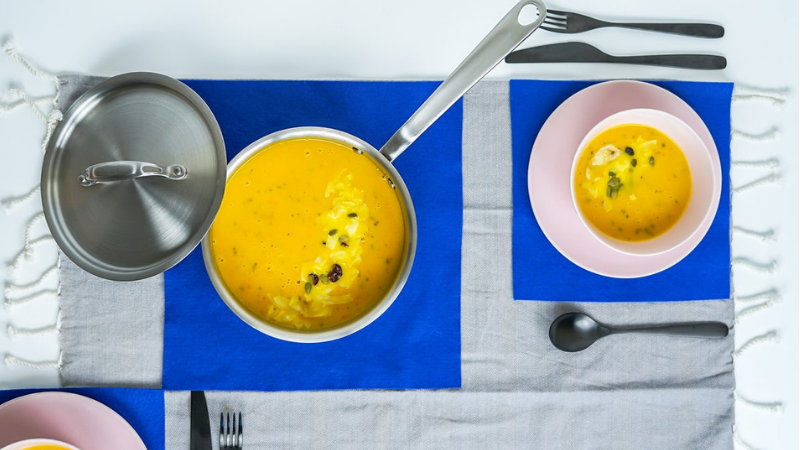 Soups are your new go-to source for office-friendly lunches. (Yay!) Please leave me a comment to let me know if this post helped you. 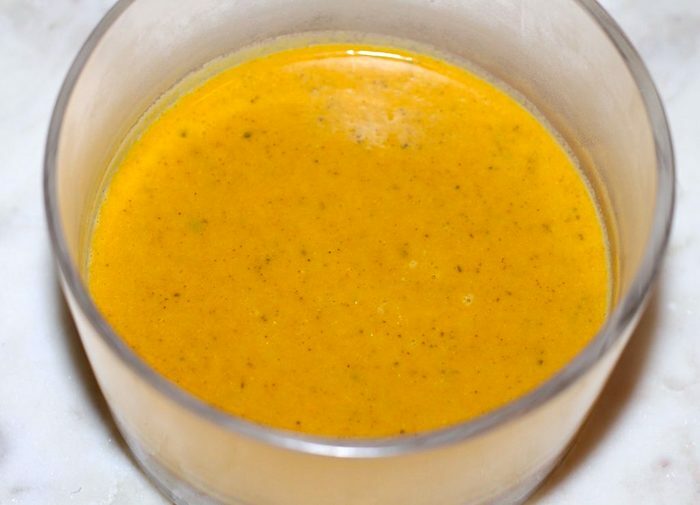 Pin this Soup Cleanse to Pinterest so you’ll have it and the recipes forever. 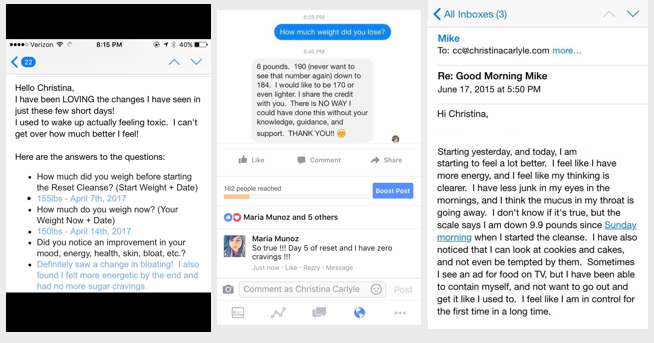 If you want to cancel out cravings, lose weight, and feel more healthy, energized and confident, check out my Reset Cleanse. It balances hormones and stops cravings from coming back! I love this idea!!! Homemade soups are a hobby for me, and I appreciate new ideas. I’ve always thought they were healthy but your explanation why, makes perfect sense…..trying to lose weight, I live on chicken breast and salads …very limited diet! In your you tube video you mentioned actual recipes on your blog but I do not see any. I would love a couple quick starters to get me going. I love this idea and will try anything. I am 5’1 and currently weigh 165. I have gained over 30 lbs in the last year and cannot lose the weight no matter how hard I try. I have soup every tea time. I feel that i have lost weight feel less bloated and find that its all i need going through the menopause.